The Gift Voucher Report will allow you to see a list of all vouchers sold over a period of time including the Voucher Code, Balance and Expiry Date. Click on the Reports option in the side menu. 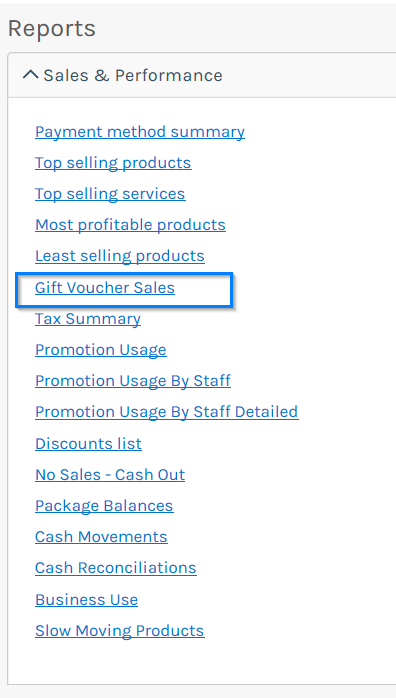 Under the Sales & Performance section you will see a report called Gift Voucher Sales. Click on this to run the report. You will be prompted to enter a date range in which the Gift Vouchers were sold. Enter the date range and click Print. The Gift Voucher Sales report will now be displayed. Important to remember to not include this in any of your sales reporting as it will be included when the vouchers are redeeming during a purchase.